Suggested by Sonic Ganondorf is a pretty strong fighter. Not only is his raw strength impressive but he also has dark magic to augment his abilities. He can take on whole armies. While Jigglypuff is no slouch in the power department either, I have to admit that she is a little outgunned here. Ganondorf is just too powerful a fighter to go down very easy and the sing attacks certainly won’t work on him. He’s got the durability to endure whatever Puff throws at him until he claims victory. Ganondorf wins. 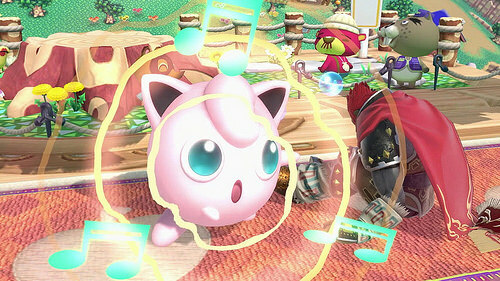 This entry was posted in Battles, Ganondorf Battles, Jigglypuff Battles and tagged Ganondorf, Jigglypuff by dreager1. Bookmark the permalink.